Capture the Colour 2013 | Oh, the Places We See . . .
Travel, for us, has become more than a mere pastime — we now plan trips deliberately with the idea that we need to see as much of this world as we can while we can. So, we’re connecting with worlds unknown not just through our own adventures but also through those of fellow bloggers — like Terri and James Vance of Gallivance, who nominated us for the Capture the Colour 2013 Photoblogging Challenge sponsored by Travel Supermarket. If you’ve been following us this past week, you may be among those who looked each day at three photos and voting for your favorites to submit in each of the five color categories — blue, yellow, red, white, and green. You have been awesome! Thanks for your support and for comments and votes. So here are our entries in the competition! When we visited Bhabiskya Ujjwal Primary School in Kavre, Nepal, one child captured our hearts. Her soulful eyes, rumpled blue uniform, and smudgy face reminded us of little girls everywhere who relish a day when school books are abandoned for a brief visit by grown-ups from America. She followed us to the edge of the schoolyard where we took her picture standing near one of the older children. 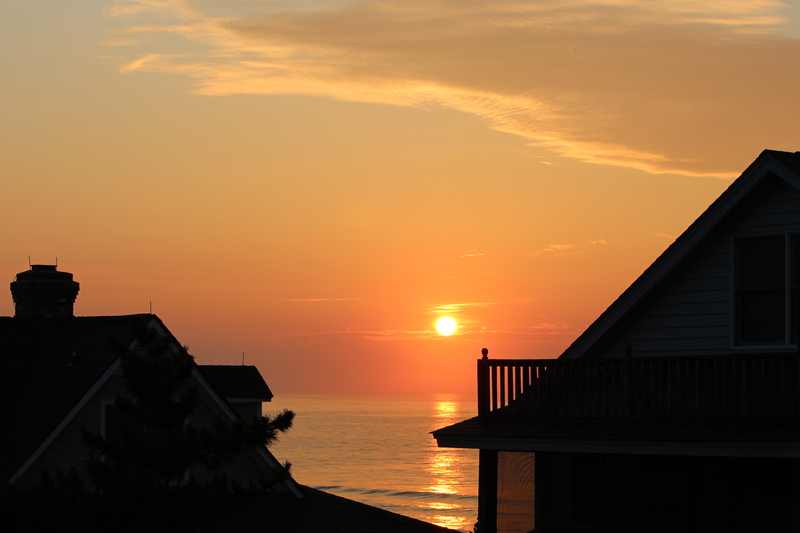 Taken from the widow’s walk atop our beach rental rental in Pawleys Island, South Carolina, this photo reveals the warm yellow rays of morning sun against the silhouettes of other rooftops around us. What a great way to start the day . . . facing the Atlantic! In Xian, China, unearthed Terra Cotta Warriors stand tall in an enormous windowed structure resembling an airport hangar built around them. When we visited, natural morning light streamed into the room, changing the stoic, stone gray figures to white sentinels ready for visitors in awe of this amazing archaeological find. While boarding the bus in rural Nepal, I noticed something coming down the road. Hurriedly, I fumbled through my bag to grab my camera just in time to snap this lady and her strapped-on bundle of green leaves and sticks. And then she was gone — moving nimbly up the mountainside to her home. It’s really quite common, our interpreter told us. All the women here gather greenery for their goats. 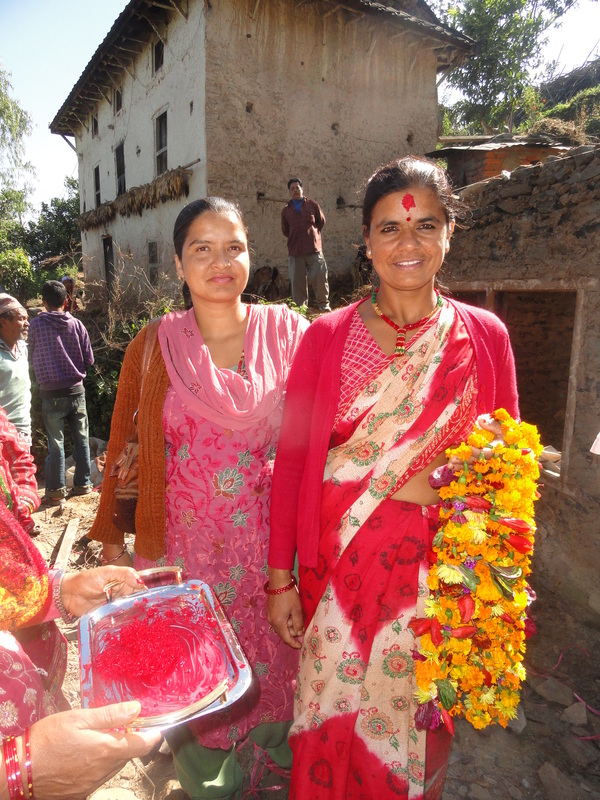 Upon our arrival in Nepal to build a mud and stone house for Habitat for Humanity International, we were greeted by ladies dressed in red bearing strings of marigolds to lay around our necks. Surprisingly, they also brought a red, gloppy concoction which they scooped up and smudged onto our foreheads. Namaste, they said. And then we knew. We weren’t family, of course, but we were as welcome as any Americans could be. And now, according to the rules of the challenge, we get to nominate five other bloggers to enter Capture the Colour 2013. Here are my nominees. Thanks again to all who participated. We’ve enjoyed hearing from so many as we looked through our photos and relived favorite moments. P. S. To follow the conversation about Capture the Colour 2013, use the Twitter hashtag #CTC13. 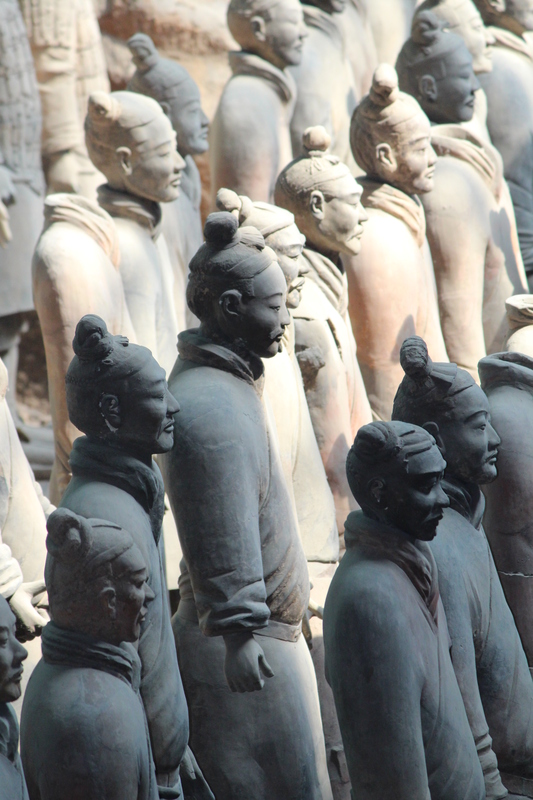 This entry was posted in Nepal, Photography, Travel and tagged Capture the Colour: 2013, China, Gallivance, Nepal, Pawleys Island, photography, South Carolina, Terra Cotta Warriors, Xian. Bookmark the permalink. Thanks so much! It was fun to look through various albums again. Appreciate your taking the time to comment! Thanks so much for checking out my photos! I enjoyed entering the photo challenge! Those of us who check out blogs also love to live vicariously. Just then of all the places we’ve “been”! Travel is a good thing! Thanks for viewing my fave photos! Thanks for taking a look at some of my favorite pics. I guess these challenges really help us sort through what we’ve got, and taking a second look is a lot of fun! I love all of your photos.. my favorite has to be green, what an incredible bundle of fresh earthen greens all tumbling about her!! Thanks for taking a look and leaving me a comment. I, too, love that picture. It just happened upon me, and I am so glad I was so close. Can’t imagine how that lady carries all that! Lovely shots Rusha–good luck! And thanks very much for the nos :-). I see you’ve done china also. Now that I’m back I must catch up on everyone’s posts including yours! China is filled with colorful slices of life. Can’t wait to see what you’ve brought back with you! all the best for competition. Thanks for visiting my site and taking a look. It was fun going through my photos! I wish I could have seen the Terra Cotta warriors, they are in the North East right? I can’t help but smile every time I am reminded of China. They are in Xian which is west of Beijing. We flew to Xian from Beijing and then traveled by bus to the site, about 45 minutes from our hotel. It’s worth whatever it takes to see this site — well-preserved and accommodating to tourists. Thanks for reading! The sunrise one is the best! Good luck! Thanks so much for reading and responding. Your preference is one of my favorites, too! Nice choices on the pics! I am one person that definitely lives vicariously through you (and your pics). Thanks! So glad you read and comment. It means a lot to me! Thanks so much! I’m enjoying this blogosphere! They are all magnificent…perfect job for this challenge. Thank you for the nomination. Thanks so much for reading and commenting. And you are quite welcome for the nomination. You deserve it! Beautiful images! The sunrise truly does show that reason for us to get up each day and embrace a new world. 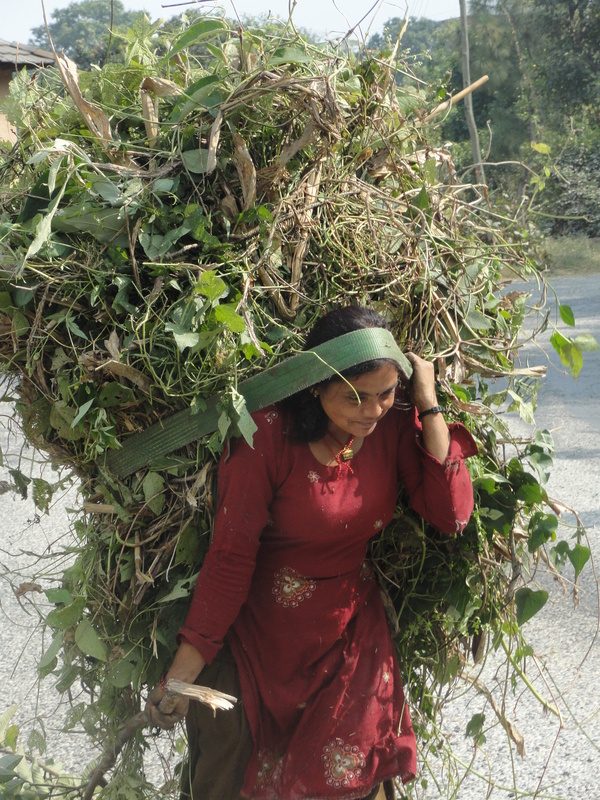 And what a great capture with the woman with the bundle of leaves, especially with the smile on her face. Wonderful! I just appreciate your taking the time to read and comment. It means a lot. All 5 of the pictures are faves of mine for different reasons!